The little series of features about what remains of Mike Hawthorn’s Surrey here on the Scarf & Goggles is intended as background to a man who will feature repeatedly in stories to come – and yet who could easily be written off as a one-dimensional caricature. 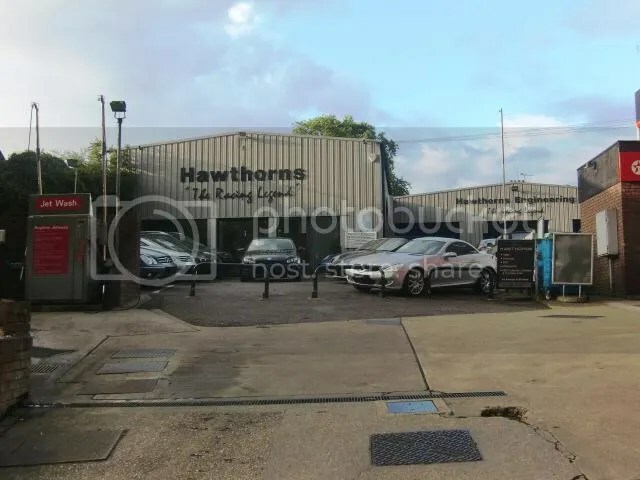 When following the route of Mike and the Members from Farnham to Tilford, for example, it was amusing to have a quick look at the forecourt of the specialist car dealer: Hawthorns ‘The Racing Legend’. As you can see, despite the name and location of the showroom, it’s covered in what the 1958 Formula One world champion referred to as ‘Kraut cars’. As his ex-girlfriend Moi Kenward recalled in Mon Ami Mate, Mercedes-Benz was a subject upon which Hawthorn was particularly strident. “We were upstairs at the 1955 Earls Court Motor Show when someone told Mike that Sir Jeremy Boles was buying a gullwing Mercedes,” she recounted. “‘He’s not buying a ****ing German car! Come on – let’s get down there,’ he said.” A somewhat bemused group of onlookers subsequently witnessed Hawthorn ranting at the Mercedes staff and Sir Jeremy – albeit too late to stop him from handing the cheque over. 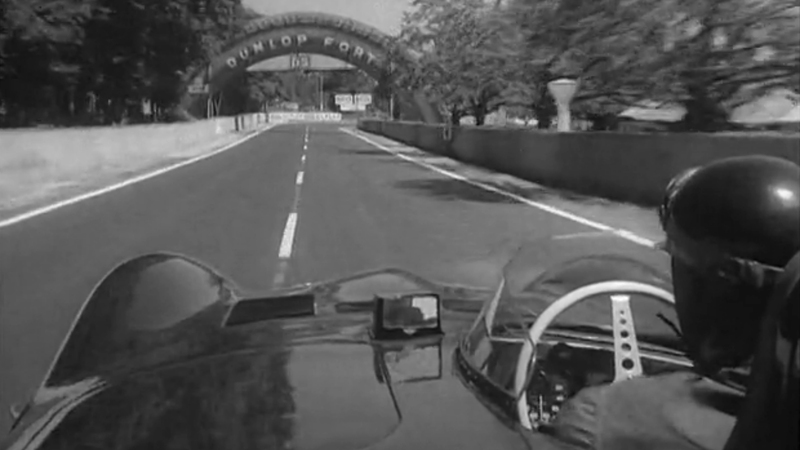 Of course, Hawthorn’s passionate dislike of Mercedes was ultimately to play a part in both of the biggest tragedies of his life: the 1955 Le Mans disaster and his own death on the Guildford by-pass in 1959. 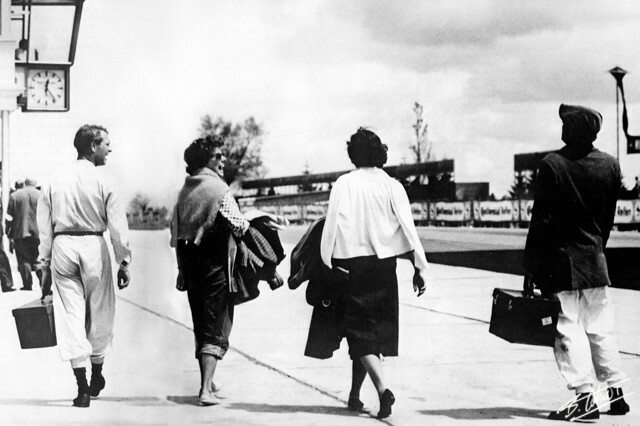 Wartime scars were very evident 60 years ago, however, and national prestige depended heavily on the success of one country’s racing cars against those of another. In many ways, Hawthorn saw himself as a member of the British Foreign Office rather than an itinerant sportsman. 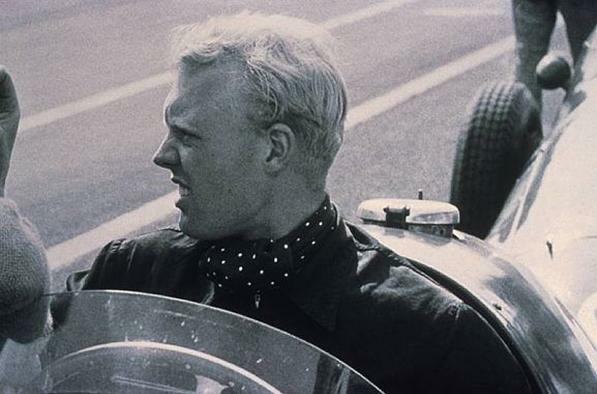 Since his death, meanwhile, Mike Hawthorn’s life has been commemorated in several ways – although a great many more have been declined. Perhaps the most popular is the locally-brewed beer that is light but strong at 5.3% and named in honour of the Farnham Flyer – although perhaps it would be a benefit if they could spell his name right! 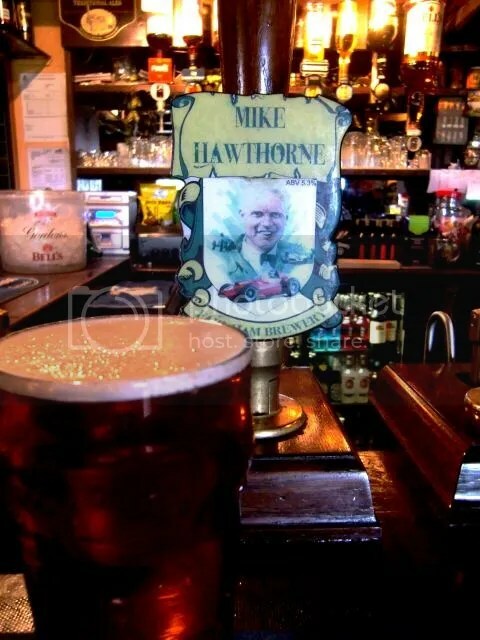 A pint of Hawthorn(e) meets the end of the day very well! Despite this little faux pas, the pub which serves this estimable pint was well known to the Hawthorn family, being about a mile north of their original home in Farnham. The Ball and Wicket – know in some quarters as the ‘Ball and Socket’ – has expanded to incorporate a well-regarded bistro and is independently-owned by the brewery responsible for the commemorative tipple, and made for a welcome pause to catch up on one’s notes. A hell-raiser in life and a uniquely tragic figure in death – there simply never was a racing driver like Mike Hawthorn. Although born in the Yorkshire mining town of Mexborough, the flaxen-haired racer moved to Surrey as a toddler and was typically known as the ‘Farnham Flyer’ in the popular British press. Much of Hawthorn’s world remains untouched out in the leafy lanes of the Surrey and Hampshire borders, allowing the chance to visit places that would be instantly recognisable to the 1958 Formula One world champion – if not always enhanced by the passing years. 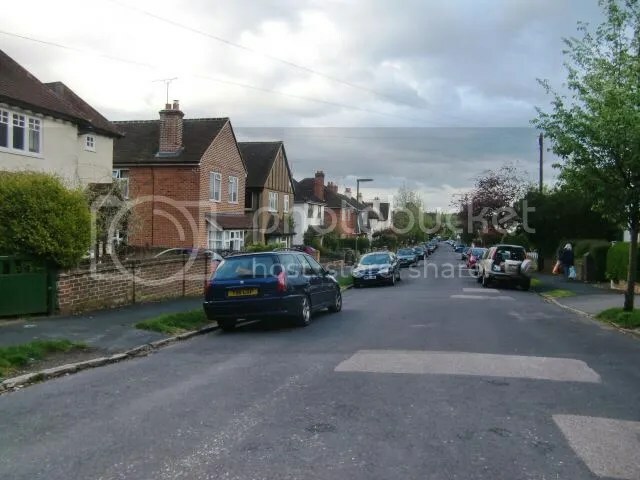 To start with here is Stephendale Road, the quiet little cul-de-sac off the main route from Farnham to Aldershot, which is where the Hawthorn family moved to in 1931. It has previously been described as Stevendale Road in Chris Nixon’s classic book Mon Ami Mate – whether he got it wrong or it’s subsequently been changed is anyone’s guess. 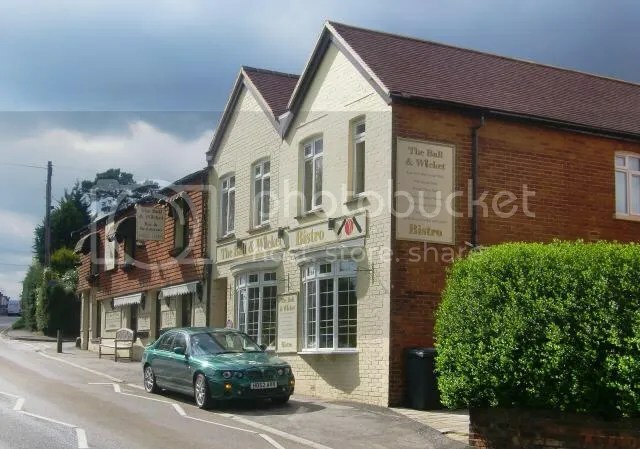 Leaving Stephendale Road and heading back towards Farnham, the first obvious landmark is The Albion pub – a favourite haunt of Leslie Hawthorn, Mike’s father. 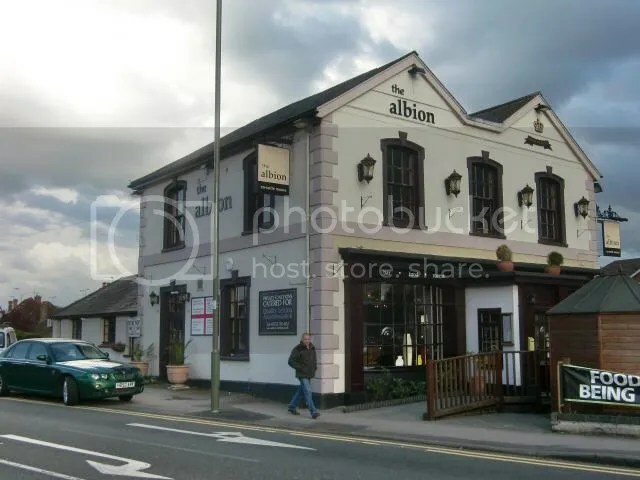 The Albion was also about half way between Stephendale Road and the Tourist Trophy Garage, with which father and son are synonymous. The garage staff became used to beer-fuelled antics going on in the Hawthorn household – Leslie and his drinking pals regularly filled the workshop with road signs and other ‘objets trouves’ from their nocturnal adventures on the way to or from The Albion. Despite the ribaldry, Leslie Hawthorn was clearly intent that his son would be a young Surrey gentleman, and as a result sent him to Barfield Preparatory School in the nearby village of Runfold – where predictably he was more concerned with sport and socialising than on schoolwork. 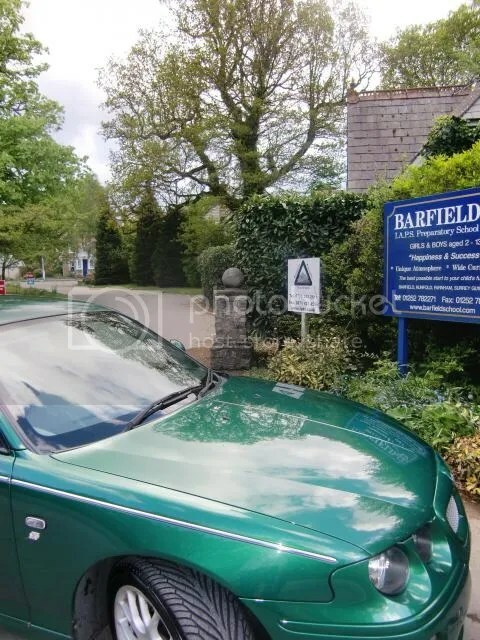 Barfield remains a highly exclusive prep school to this day, where pupils enjoy the amenities of the Mike Hawthorn Sports Hall. From 1942, Mike went off to Ardingley College, a prestigious public school at Hayward’s Heath in Sussex. His father, meanwhile, was a pilot in the Air Transport Auxiliary during World War 2 – although neither boarding school nor military duty seemed to keep father or son away from home for too long. Meanwhile as Mike grew up, he and his hand-picked gang of friends were formed as the ‘Members’ – and we’ll catch up with them in Part 2. 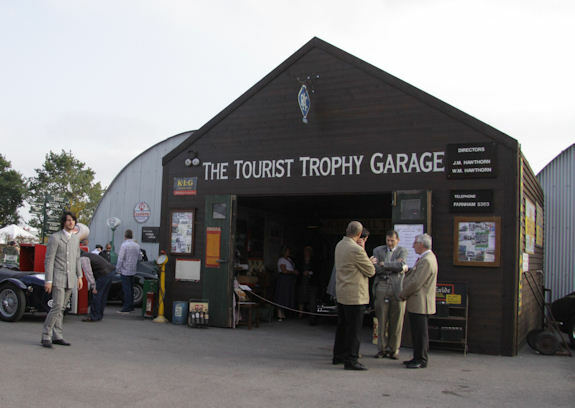 The Tourist Trophy Garage in Farnham, Surrey is an icon in the British motor racing fraternity. It is here that Yorkshireman, engineer and keen motorcycle racer Leslie Hawthorn arrived with wife Winifred and two-year-old son Mike in tow in 1931 set up shop with former Isle of Man TT winner ‘Paddy’ Johnstone in what had been a World War 1 army hut on the Aldershot road. 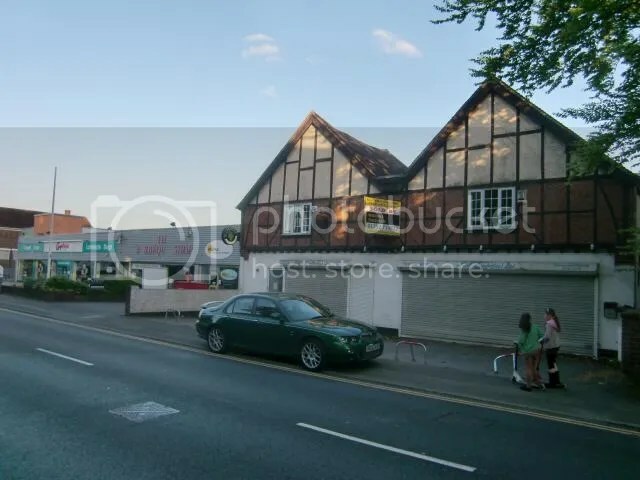 It was Farnham’s proximity to Brooklands which brought the Hawthorns southward. Leslie was a keen racer with an even keener business brain, and the garage gained a strong reputation for preparing racing motorbikes, selling cars and carrying out tuning and repairs. As the business grew, so too did the premises – spilling out from the original wooden hut into a much grander complex at an old hop kiln next to the Duke of Cambridge pub, featuring a glass-fronted showroom and significant workshop space. Soon after World War 2 Leslie’s son Mike began to take an interest in competition; first on motorbikes and then at the wheel of a pre-war 1100cc Riley Ulster Imp and, later, a 1500cc Riley Sprite which father and son worked hard on at the back of the premises. In 1952 young Mike’s career went stratospheric, courtesy of a brand new Cooper-Bristol Formula 2 car that Leslie tuned to run on his own special brew of nitro-methane enhanced fuel. 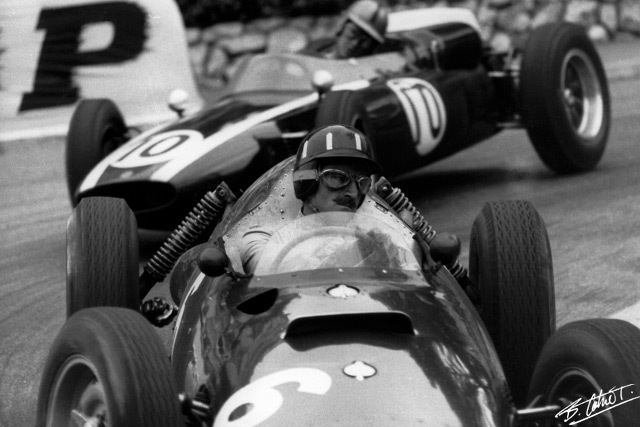 With it Mike won the Lavant Cup at Goodwood to start a brilliant season which ultimately earned him a seat at Scuderia Ferrari for 1953 and the beginning of his path to legend. As his career progressed, the T.T. Garage remained very much a part of Mike’s day-to-day life – and all the more so after Leslie Hawthorn died in a road traffic accident when returning home from a day’s racing at Goodwood in 1954. Winifred Hawthorn took over the management of the garage with aplomb but Mike was ever-present and it was through his relationship with Maranello that they became the first British importer of Ferrari road cars, giving the 250 GT PF Coupe its debut at the 1958 London Motor Show. 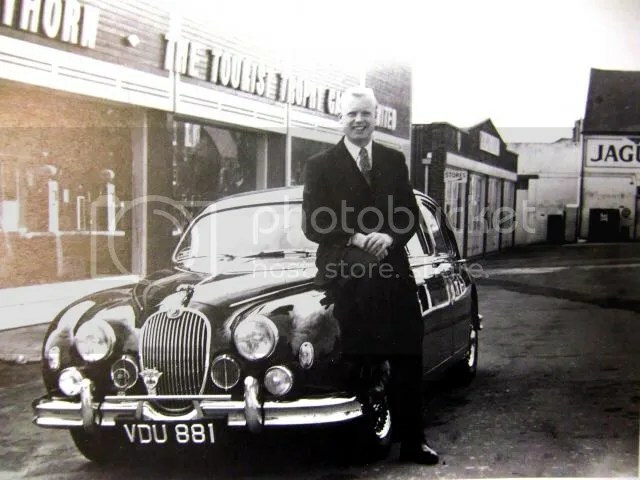 Having won the 1958 Formula One world championship and announced his retirement from motor racing, Mike intended to settle down to the business of running the T.T. Garage himself n 1959. This plan, together with those for his forthcoming marriage to the model Jean Howarth and his new competitive outlet air racing in his Percival Vega Gull, was however cut short in by his fatal accident at the wheel of his beloved Jaguar 3.4 on the Guildford by-pass on January 22 1959. For many years I had believed that the T.T. 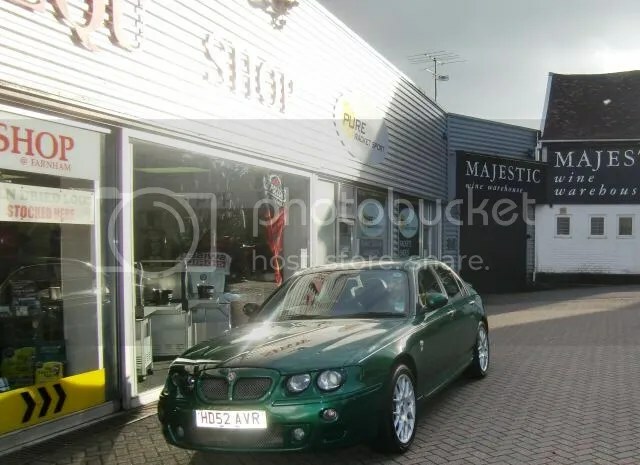 Garage had long-since been demolished to make way for a business park – but in fact it is still there on East Street – albeit with sports goods and electrical equipment now behind the showroom glass and a more modern frontage bolted on to the original brickwork. Of course the somewhat rickety roofline of the adjacent building pictured in 1958 gives the game away – now part of the Majestic wines empire, of which doubtless Mike would approve! The whole area is now a miniature business park, although in the old workshops there is still a specialist vehicle preparation company keeping something of the spirit of the old place alive. Next door to the garage was the Duke of Cambridge hotel, a regular watering hole for Leslie Hawthorn and later where his son would enjoy a regular meal and a pint or three – usually without handing over any cash for the privilege. Charlie Bishop and his wife Marjorie were landlord and landlady throughout Mike’s life in Farnham and doted on him despite the fortune he owed them on the tab.